Photos of colorful rolls filled with vege & fish have been seen on our social media channels for months now! 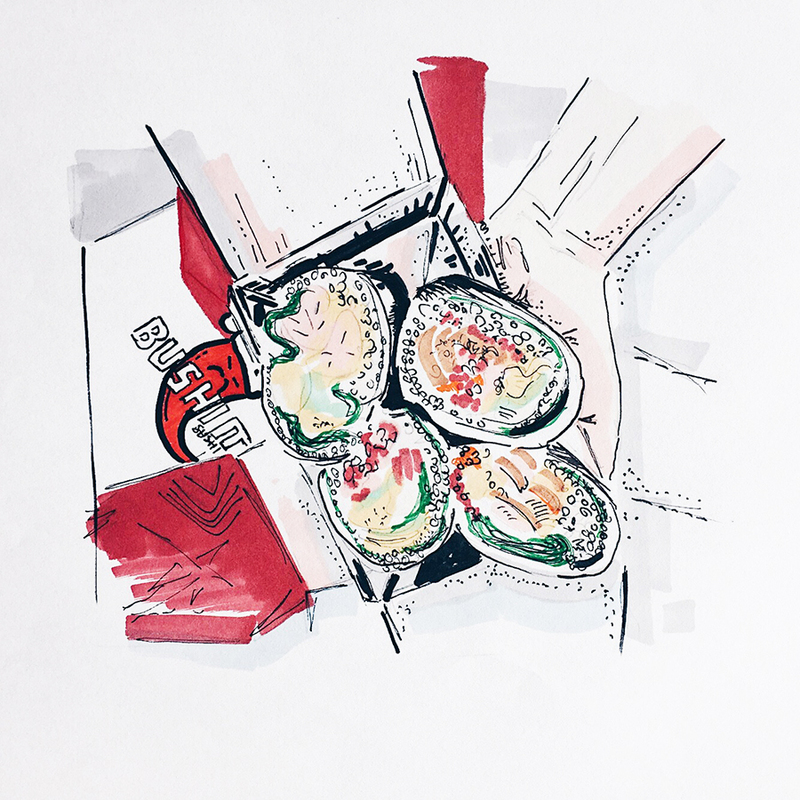 Since we’ve tasted sushi burrito for the first time, we… are truly in love this idea! Today we present you our next MYTUJEMY card fully about Bushimi Sushi Burrito. Happy reading! The owners of the BSB have been fascinated by travels for many years. Each of their expeditions bring incredible memories, new taste discoveries and culinary inspirations that they use to create next foodie concepts in Poznan. Following the success of the sushi restaurant in City Park, they really wanted to open a new place. A spot completely different, fresh and unknown in Poznan. From the comination of Japanese & Mexican food thet created… BUSHIMI SUSHI BURRITO! This hot culinary duo abroad makes a lot of fuss – San Frascisco – that’s where people went mad at sushi burrito! Anyway, to find out that sushi buritto is a big deal – read the article here. This kind of food combines two of the world’s most beloved cuisines – the traditions and flavors of Japan and the spicy vibes of Mexico. In the form of burrito wrapped in nori alga you will find unusual flavors, high-quality ingredients (including rice, seafood, vegetables) & you’ll discover the best crunchiness! In addition to that… sushi burrito is super healthy! Do you want more? Bushimi Sushi Burrito creators in informal conversations constantly emphasize that their place is based on products from proven fresh food distributors from all over the world! After choosing the specialty of the new spot, the name was only a formality – the distinctive and loud BUSHIMI SUSHI BURRITO immediately gained new fans! Part of the name – bushimi – comes from the Japanese sashimi, the Japanese way of serving fish, meat and seafood in a perfect way. Burrito is a Mexican classic, served in a stuffing wrapped in wheat tortillas. In the name BUSHIMI SUSHI BURRITO you can feel intensely penetrating two cultures, but also the elegance of the Japanese cuisine. Fusion of two kitchens – the explosion of flavors in every bite guaranteed! The owners agree – Poznan is their city and they can not imagine creating a new concept elsewhere. Poznań is a wonderful place and people are great – honest, hardworking and full of passion. “We want to encourage Poznan based people to explore and discoVer what has so far been unreachable,” says Bushimi’s owner with a smile on her face. For us, Poznań is still sometimes hermetic and preventive. Don’t be afraid to try. Our taste buds love exploring! Bushimi Sushi Burrito is located at Towarowa Street, right next to the University of Economics. Why there? Bushimi owners are following the spirit of the West and create the atmosphere of Berlin’s pubs, where people often order food and picnic in the parks near the restaurant. The interior of the spot is full of energy, just as their employees – ALWAYS with smiles. Red walls are the best style interior – just look! In addition to the stationary place, sushi burrito rolls can also be ordered by phone or online at www.bushimi.com. In addition to the daily activities of Bushmii, you will also find at Nocny Targ Towarzyski, where they feed all the foodies during the weekend nights. SUSHI BURRITO IS ALWAYS A GOOD OPTION! Rolls with distinctive red peppers are packed with students hurrying to classes, businessmen on the run from one meeting to the next, and seniors! Poznan has gone mad, and more photos with the #Bushimi_Sushi_Burrito hashtag and their location appear on Instagram! Besides all, in their offer you will also find catering. They are truly experienced in what they do. Gringo samurai spinning rolls on the event can be a hyperinteresting phenomenon. Catering from Bushimi will be perfect in a variety of situations – at sporting events, family celebrations, company meetings, integration meetings and more. Always fast and efficient. You take, you go on… and you’re already in Mexico and you feel Japan. For help we asked our friends who had visited Bushimi many times. Most of them enumerated similarly: Tori Panco, Sake Asado, Chilli Con Carne. For us the biggest thing is the Verduras Tempura – tempura is a Japanese cake that is prepared in Bushimi in special ice containers – as they do in Japan. Have you read our article? Pass it on. Remember that sharing is caring! Find more on our Instagram & fanpage. Our official hashtag – #MYTUJEMY – tag your photos & help us find you! The text was created in cooperation with Bushimi Sushi Burrito – thank you.